My Writing Spot: My Writing Nook update - now netbook-friendly! I've just released an update to My Writing Nook. This is a fairly minor release - basically just cleaning up a few minor annoyances, such as the fact that after creating a new document, you would have to click on the editor before you could start typing. I also wanted the tooltips for the command buttons to display themselves faster, so I added some snazzy new tooltips to them. Finally, I noticed that while the app was sized perfectly for my desktop and my laptop, it wasn't too friendly to my netbook. I have the original model EeePC, with the 7" screen, and the sidebar just didn't work that well in such a confined space. 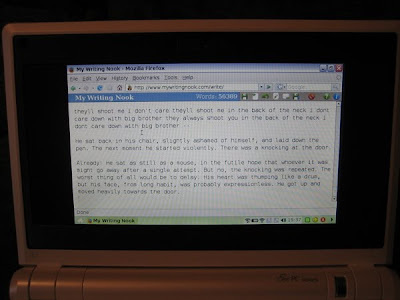 Since I imagine that many people will be using netbooks during NaNoWriMo, I want to make sure that smaller screens are well-supported.